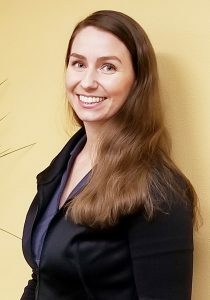 Andi grew up in California and obtained her Bachelor’s Degree in Kinesiology with an emphasis in athletic training from San Diego State University. She moved to North Carolina to complete her Master’s Degree in Exercise and Sports Science from the University of North Carolina, Chapel Hill. During her time at UNC, Andi greatly enjoyed working with the school’s cross country and gymnastics teams. After graduation, she moved to Virginia and gained experience treating a wide variety of patients in an outpatient physical therapy and sports medicine clinic. Andi discovered her passion for dance and performing arts medicine while working with a local ballet company in Virginia. She is also a certified massage therapist and a licensed chiropractic assistant. Andi relies on evidence-based research in designing her rehabilitation programs, keeping up-to-date on current health care standards and working very closely with the doctors and other providers at Absolute Wellness. She strives to create a safe and welcoming healing environment throughout the treatment plan, while also ensuring her patients have the skills and confidence they will need to prevent re-injury and stay healthy and strong long after in-clinic care. In her spare time, you are likely to find Andi hiking, reading a good book or socializing with friends. She has also taught both aerial yoga and barre, a ballet-inspired workout.